Garden Spot: Meyer Lemon Tree. Last year my hubby gave me a Meyer lemon tree, about 4 ft. tall. I got 7 lemons! This year, there are very few leaves, a few blooms....what have I done wrong? Help! The Meyer lemon tree is one of my personal favorites. I particularly like the fact that it blooms all year round! I have a Meyer lemon tree in a pot that I keep indoors. I live in Wisconsin. When I purchased it it had a small lemon that grew and turned yellow. Since then it has had many flower buds like crazy but then they fall off and that is it. Should I cut some of the buds off? Is it not getting enough sunlight? Any suggestions would be greatly appreciated. My wife and I purchased a lemon tree in Florida it is now producing fruit. The lemons are large and we do not know if we should leave the fruit on the tree till they turn yellow or remove . I have a 3 year old Meyer lemon tree desperately in need of pruning, and need guidance. 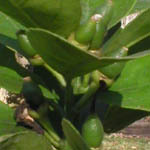 It is healthy and full butdid not produce much fruit this year. i bought a meyer lemon tree a couple months ago and now i love it! now i alwase have a fragrent tree, and juicy sweet lemons. My lemon tree has been producing beautiful lemons for 3 years. Is it possible to root a cutting? Last year my lemon tree had buds, but soon fell off. They have done the same thing this year. The perious ten years the tree has been productive. I recently bought a meyer lemon tree and after about 3 weeks, all of the buds have fallen off. I keep it outside and fertilize it every other week. Can anyone please help me? How often should a myers lemon tree produce? Do you have to pruin them? How can you make it produce more often? I have had mine for going on two years and its only produced 2 lemons, Can anyone help?? I have had my Myers lemon tree now for over two years. I have had a couple of timy lemons about the size of a pea then they fall off. I don't smell alot of fragrance off my tree. I keep it outside until it gets cold then I bring it back in. My tree is only about 2 1/2 feet tall. Do I need to cut it back or what am I doing wrong ? Please help. We are getting ready to purchase a lemon tree here in Orlando and are unsure which one will produce the most lemons. Do you suggest the Meyer or would another variety be better?? Also, is this a good time of the year to plant one? I had two meyer lemon trees in New Orleans before Katrina hit that were magnificent producers year round almost immediately. Now we've relocated to Lakeland, Florida and planted two new trees that are not doing too well. The new shoots are withering and crinkling, blossoms fall. Am told this is due to leafminers. Have applied fungicide to no avail. What should I do? Move them to another place in the yard? Can you recommend any medication? Help! I have had a Meyers Lemon tree for 3 years, grew too large for pot so planted it in ground this summer on the south side of house. 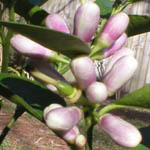 It bloomed, produced dozens of lemons which remained on the tree ripening until December. It has thrived and grown; I love it! I hope it will make it through the winter (lower zone 7) as it's too large to dig now. I have a 2 ft Meyer Lemon tree in Northern CT. It was outside all summer. It has produced(1st year) about 8 lemons. During the late summer & fall one by one, slowly they are all falling off, I have 2 left I is about 2&1/2". It seems like as summer ended,the lemon has stopped growing. I fed it citris fertilizer at the right times, June & September. Last winter all the leaves along the stem, except the top branches,all fell off. And it hasn't grown much taller.I mist it almost every day. Does it need a grow light. I don't have a real sunny house. When its sunny it does get sun, every day. But it is by the back door, so when we open door up,does it get cold? I have a meyer lemon tree that I have had for 3 years. I got about 7 lemons last year. I also had aphids and used a fugicide and soap and water on htem. My tree is in my house for the winter and is loosing all of its leaves. Do I still have a bug. Is it to hot for it. Help? We don't know what we did but our Myers Lemon Tree has produced year after year bushels of lemons. We live in El Paso and cover the tree in plastic for the cold weather. The lemons get to be the size of oranges. They will keep growing until you take them off the tree. All we do is fertilize it, water it and harvest the lemons off it. My Meyer Lemon Tree produced blooms and tiny lemons, and they turned black and fell off the tree. The tree is growing and looks great. It has been in the ground for two years, and last year produced great lemons. What happened?